1: Choose The Number Of Lines That You Want To Purchase. 2: Choose The Proper Font That You Want To Use. 3: Describe Proper Placement (Example: Jeff-Below The Logo). Write "No Engraving" In The Box For Non Personalized Items. 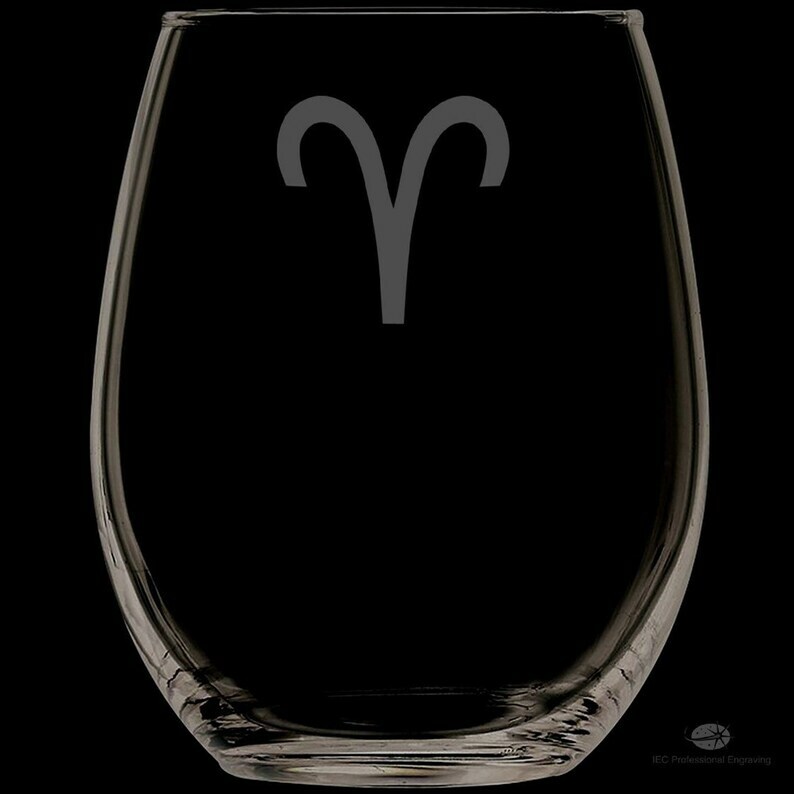 This 13 Ounce “Aries Stemless Wine Glass” can be personalized for long lasting memories. “Both” the front of the glass and the back of the glass can be personalized. You can add up to 2 Lines of engraved print above the logo, and/or 2 lines of print below the logo($2.00 per line, up to 25 characters per line). You can also add up to 8 lines of print on the back of the glass($2.00 per line,up to 25 characters per line). IMPORTANT: It is very important to choose the proper add on selections in the "Personalized Add Ons" drop down boxes. If you only want the logo or design, choose "Plain (as Displayed)" in the “Personalized Add Ons” drop down box. If you want to add the logo with engraved print, choose “Logo + the appropriate number of Lines of print that you want to have engraved. Then choose the appropriate "Font" you want to use. Then write what and where you you want the engraving to be located. (Example Given: Please add “Somersworth” above the logo, and Add “Local 2320” under the logo. Then add “30 Years of Service” in 2 lines on the back). If you want to use a font that is not listed, please write down the name of the font that you want to use. As long as I can get it, there will be no charge for choosing your own “unlisted” font. If you leave me a phone number for a text, a valid Email address, or start an ETSY Conversation, I will email you a photo of the finished product before I ship it (Personalized Products Only). That will give you the opportunity to approve the product before it ships. Product will be placed in a gift box, with bubble wrap, and gift wrapped. I love these mugs beautiful design, I've been looking for just a set of two and they're perfect for my Macchiatos and other drinks they arrived very fast and as described by seller thanks IEC, I'm very happy with my purchase!! This is going to make a great birthday present. I had such a wonderful experience working with this company and the owners! I purchased multiple of the customizable Irish coffee mugs and the owners were wonderful about being flexible with my font (one of the unlisted fonts), were honest about how the best ways to fit the words I wanted engraved, and helpful with which options I was supposed to click during check-out. In addition, I really needed these glasses to arrive in Chicago in less than a week and they were super quick to get me draft photos so they could quickly and beautifully complete and ship the order, which got to me a day or 2 earlier than expected! Highly highly highly recommend these guys!